The large colorful mass of florets that form a ball on a single stalk of a hardy geranium plant is the perfect addition to a large floral arrangement. Imagine the deep red blooms with white chrysanthemum Starburst poms and blue delphinium for a patriotic 4th of July basket. Mix a selection of pink Prostratum blooms with crimson veining and yellow roses for lacy feminine wedding centerpieces. You can make these arrangements by using geranium blooms as cut flowers in a variety of fresh floral projects. Geranium flowers are more than colorful plant decorations. A large mass of florets bloom at the top of geranium stems. Choose a stem with a series of budding geranium florets for a long-lasting bouquet. Full-bloom blossoms are fine to use in a floral piece that is on display for a daytime or evening event. Snip away any dead florets from the full-bloom mass with a pair of sharp floral shears. Cut the stem from the plant just above one of the nodes or bulbous portions on the stalk. Place the stem immediately into a container with lukewarm water. Cut leaves from the plant for greenery in the arrangement. Leaves can survive up to two to three weeks in an arrangement or vase of water according to Superb Herbs. Re-cut the stem on a slant when in the process of making the floral arrangement. Use a water source to keep the flowers hydrated. 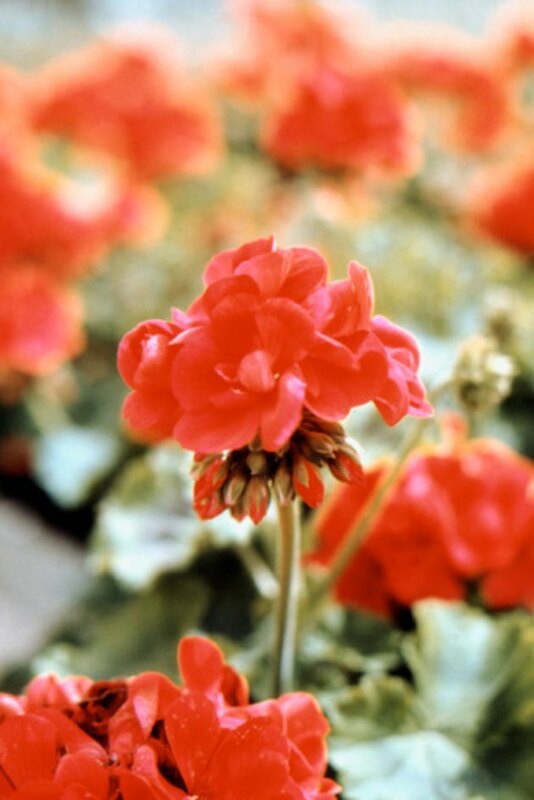 A floral foam-filled container or vase of water supports the geraniums with fluid. Insert the stems into the floral foam as you support it firmly with two fingers to keep the thick greenery from bending or breaking; it's positioned into the foam up to the point where the next rounded node is. If the stem is too tall, pull it back out, and cut the stem once more.